including the health of all inhabitants. This black and white symbol is actually called the T'ai Chi. It occupies the center of the BTB Bagua and represents the Taoist theory that all things are connected. Everything consists of Yin (receptive) and Yang (active) energy. It illustrates all energy in a state of constant change. The T'ai Chi is a symbol of balance in the universe, in your living space, in your life. 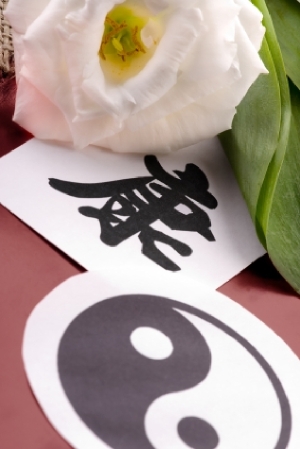 The Chinese character in the photo means health. A secret to create balance between the Yin and Yang in your Health Center is through a fusion of Feng Shui (Yin) and Solar Power Design (Yang). It is a marriage of seen and unseen factors. This blending of ancient secrets and modern technology, in harmony with nature, is a balanced way to empower your home. Where is your Health Center? If your living space is a rectangle or a square shape, finding the center is usually easy. It is more challenging with unusual shapes. To find the Health Center of your space, begin with a proportional floor plan drawing of your home. Make a dot in the center of each room. Now connect the center points. Within these lines is your center. Sometimes this is outdoors. That is OK.
Place a healthy plant, a solar light, or a faceted lead crystal sphere anyplace in this area. Perform the Three Secrets and set your intention that your home has a strong Center. If you discover a bathroom sitting in the center of your living space, I recommend that you perform a Feng Shui Secret Cure. Contact me directly for instructions to get the cure you need. 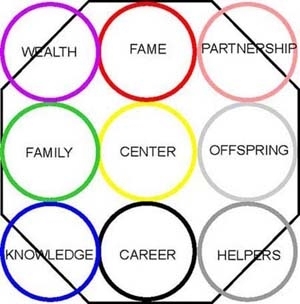 My experience has taught me that those with a toilet in the center are more likely to have problems with Family, Money, Reputation, Marriage or Emotions, Children and Creativity, Helpers, their Careers or matters of Discernment. The most common complaints involve Health issues as illustrated in the following example. "One client lived with her husband and daughter in a house with a center toilet for eleven years. She told me that four years after they moved in they all began to experience bad health and bad luck. For seven years, the daughter had complaints of allergies, irritable bowel syndrome, chronic stomach pain and constipation. The day I performed this cure with the client, her daughter had not had a bowel movement for three days. She was visiting a neighbor and was not aware of what we were doing. After we finished the ceremony and I was preparing to leave, the daughter came running in the door exclaiming that she had "gone to the bathroom!" Her mother looked at me with a big smile on her face. I realized what she meant." The way I view these experiences is from an energetic perspective. A "cure" shifts the energy (ch'i) of illness to create an opening for healing. True healing of dis-ease requires many levels of understanding and treatment. Feng Shui is one level that allows an opening in the chi for healing to begin. I find that my ADHD symptoms and my depression are reduced and my mental health improved when I practice the Inhale-Exhale Breathing Exercise each day. Feng Shui Secret Tips also include meditations and exercises to balance your personal inner ch'i. Clearing Clutter is another tip I use to maintain my mental health. Because I am so sensitive, too much stuff in my space confuses me. Even attempting to clear my environment of unneeded things has an organizing effect on my mind. I also enjoy using Feng shui colors as a means to improve my mood and inspire me. I think you will find that The Feng Shui Secret Tips are fun and easy.